Oakland's Middle Harbor Shoreline Park sits on a bit of reclaimed land in the San Francisco Bay. The Port of Oakland surrounds it. It's a rare treat to have a park surrounded by industry with a great view! 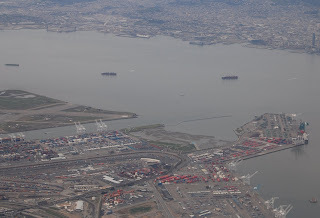 Naval Air Station Alameda was situated in the center-left of this picture. Nowadays it's used for not much more than a Mythbusters test track.